On Wednesday, March 19, the Department of History at York University will host the 2014 Melville-Nelles-Hoffmann Lecture in Environmental History. This annual event brings leading scholars in the field of environmental history to Toronto to speak about their latest research. 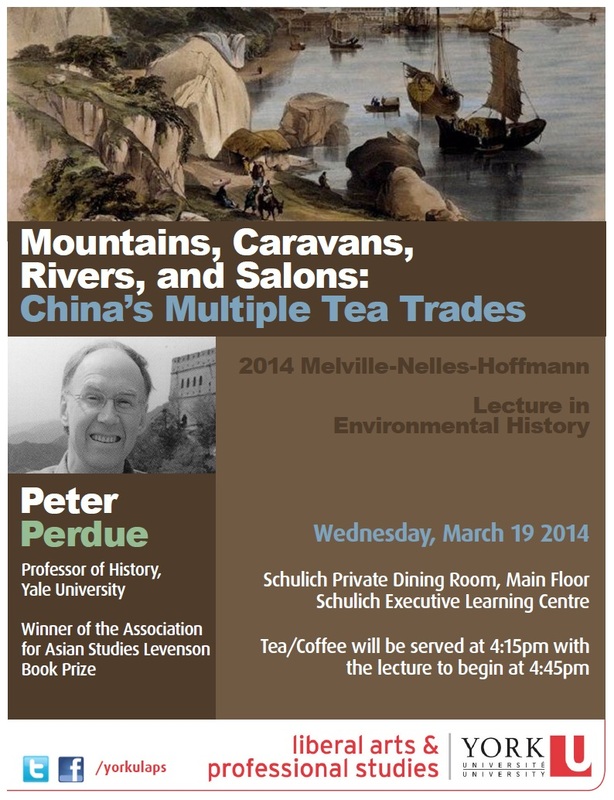 Peter Perdue (Yale University) will deliver this year’s lecture with a focus on the history of the Chinese tea trade. Professor Perdue is a leading scholar of modern Chinese and Japanese social, economic, and environmental history. He is the winner of the 2007 Joseph Levenson Book Prize from the Association for Asian Studies for his book, China Marches West: The Qing Conquest of Central Eurasia. Join Professor Perdue and the Department of History at York University for this exciting and fascinating exploration of one of the world’s greatest export commodities, tea.